You are here: Home / All Articles / “PLAIN” Designs by Ambrose Schlegel…anything but PLAIN! L to R: Original signed by A. Schlegel, Mulberry glaze; #83 previously undocumented, Dark Green matte glaze, 1902, 4.75″ height; #426, 1905, Green matte curdled glaze, 9″ height, dark clay; #416 Mustard matte glaze with Green over spray around the top, 1905, 6 3/4″ width; #320 Green glaze with curdled Red over spray, 1906, 7″ height; #416 Purple glaze, 1905, 3″ height. There were 953 designs created between 1900 and 1912; which are noted elsewhere on the site. Primarily, Artus was the main designer; with Anne designing a few & becoming the primary designer after Artus’ death 7-4-1904. J. Emma Kinkead was a talented high school art student, who worked for the VBPCo part-time until her graduation, and then full-time for $5/week after graduation. J. Emma’s grandson has been a wealth of information, sharing her written documents, photos & audio tapes. Ambrose Schlegel was a talented potter, who worked at VBPCo from at least 1903 until shortly prior to his death in 1931. Artus, Anne, & later designers depended upon him for the “plain pots” upon which they created their designs. With their requests to Ambrose as to approximate size and shape; Ambrose would throw the pots on the wheel for their design work. There were several periods of Artus’ short life that he sought respite away from the pottery; at Chico Basin Ranch, and tuberculosis sanitariums; as well as in the warmer climate of Arizona during the harsh Colorado winters. By studying the 2015 “Revised Catalogue of Van Briggle Designs,” one can almost assuredly determine the times of Artus’ absence. Artus arrived in Colorado Springs, March 1899 and first lived at Chico Basin Ranch. He was photographed created Design #1, the Chalice, outdoors at Chico Basin Ranch. Designs #1-20 were recorded in 1900; Designs #21-41 in 1901. In 1902; Artus & Anne were married, and history records that he spent time in a tuberculosis sanitarium. Throughout the recorded designs of 1901; you will see several “plain” designs, which J. Emma Kinkead attributed to Ambrose Schlegel. The same pattern of designs continues into 1903, to a lesser degree. By mid-1904; Design #247 is the last attributed to Artus. Until late in 1904; the majority of designs are “plain” again. Van Briggle collectors have long admired the work of Ambrose Schlegel, but had not until recently fully understood his importance with the history of the pottery. In studying the design catalogue; you can see his influence in literally “keeping the pottery afloat” during the period of Artus’ absence. 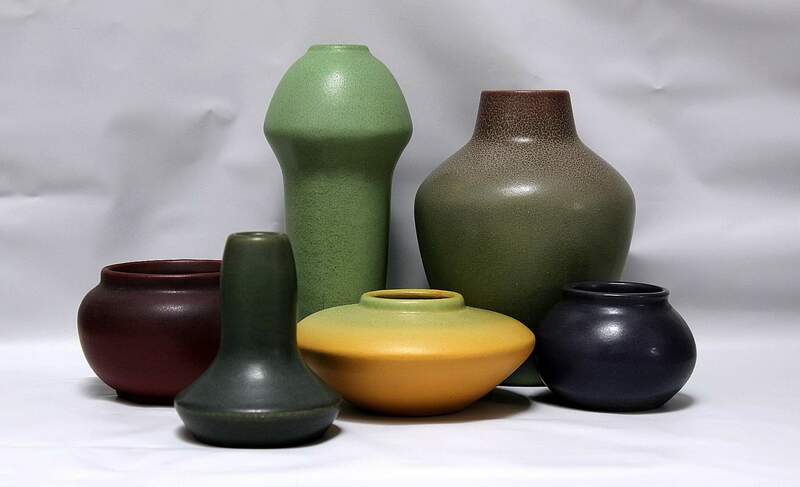 While perhaps “plain” in style; these pieces are beautifully adorned with spectacular glazes! !